It couldn't be anymore VERMONT!!! A wonderful Log cabin that you can feel at home the moment you enter the driveway. It is away from it all and you have plenty of space inside and out to relax and reload your energy. Tucked away in the woods of Vermont, completely private and yet close to everything. Only minutes outside of Stowe. Indoors you can feel the warmth, charm, and uniqueness of Vermont. And a fire in the woodstove after a day outside will add to the experience of a life time. The bedrooms are cozy and roomy and there is nothing better than to soak in a big old-fashioned clawfoot tub, but there is also a shower in the other bathroom for your convenience. One thing we know for sure, you will feel right at home! The snowmobile trail starts right out the back door and for the cross country skiers we have the catamount trail right out the front door which runs down to Stowe and up towards Craftsbury for miles on end. But every season has its charm and we will have a list of beautiful sites ready for you which sometimes are only known to locals. Waterfalls and Swimming holes are all around. Of course we also welcome your pets and the backyard is fully fenced in so they can enjoy fun without a leash. We will receive you with a warm home and heart! We loved our stay at Claudia’s cabin and the chance to unplug and unwind in rustic tranquility. A stone’s throw from the “action” in Stowe - the cabin was perfect for our family of 5 (3 teenagers.) Claudia was an amazing host - who (according to our Beagle) redefines the term “pet friendly.” We want to come back! What a cozy, romantic cabin. We loved everything about it. We cooked a full blown Thanksgiving ! Very welcoming, our dogs had a blast! Beautiful scenery, walks, trails. A super fun Thanksgiving playing cards, cooking together. Can't wait to be back at Claudia's peaceful Karma Cabin for Christmas! We had a high of 21 & low of -6! The wood stove was so great to have! We are coming up North to retire! 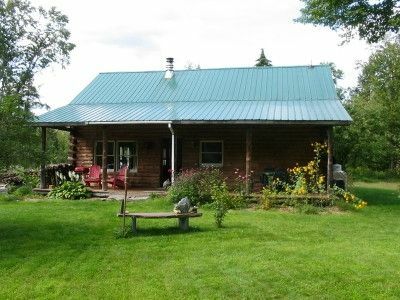 The cabin is perfectly located, just outside of Stowe, yet right in the middle of the woods. You'll love the fire pit outside for late nights, or enjoying the stove inside when it gets too chilly. Claudia is a great host, being just enough present to let you enjoy your stay. My family and I stayed in this cabin over the long weekend with our dog. We had ample space for our 2 kids in this 2+ bedroom place. Th eteenager was happy to have his own room while the 10 year old loved the loft. We had fun playing outside and there was a decent sized fenced in area for the dog. We would definitely come back and stay here when in the area as it is clode enough to everything in Stowe but far enough away that it is calm and quiet. My husband, our two old dogs, and I absolutely loved our short stay in Claudia's Cabin. Claudia was so welcoming and kind, and so sweet to our pets. The actual space is charming and well kept up, and had everything we needed. The outdoor spaces are gorgeous and Claudia brought us homegrown produce from her garden. We would absolutely stay there again and recommend it to any low-key travelers looking for a cozy and welcoming rustic space to spend time. Thank you, Claudia! We had a wonderful long weekend in this charming rustic cabin, loved all the sweet touches such as dangling Christmas (fairey) lights both outside and inside, beautiful natural staircase in wood and just a very cozy feel in general. Perfect for a winter getaway. We cooked in both morning and evenings and warmed up with the wood stove fire place. The downstairs bathroom with the shower could use some updating and some TLC. While we were there our host Claudia let us see one of the other cabins on her property, the one with the Birch tree in it. I think we would stay there if we returned. Just a bit more updated but still rustic and charming. Can't wait to return to Vermont ! Thanks Claudia for having us!